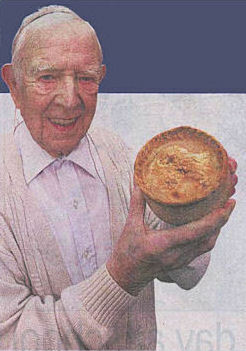 Ninety nine year old Alec Fozard has been making pork pies since he was 13. So the award winning pork butcher decided to show Calderdale's very own Pork Pie Appreciatlon Society how its done. Mr Fozard, who was European black pudding champIon in the 60s, was invited by the group to be a guest judge at the 15th Annual Charity Master Pork Pie Maker Competition In March. While sampling the competitors offerings at the Old Bridge Inn, Ripponden, the pensioners of Batley, promised to make the members one of his own pies. And keeping to his word Mr Fozard, who turns 100 in December, produced a succulent homemade treat just last week, which the panel swiftly dubbed one of the best they had ever tasted. Mr Fozard, who has three children, eight grandchildren and four great grandchildren, entered the butchery trade at 13, working in Cleckheatdn and Bradford. In 1935 MrFozard opened his own store in Staincliffe, near Dewsbury, where he worked for 37 years never taking a full week’s holiday. Mr Fozard said: “The best pork pie needs good ingredients, plenty of experience and some­one who Is interested In what they are doing,” he said. He still makes pies twice a year and bakes 20 Christmas cakes every year for friends and family. Kevin Booth and Richard Neville, from the society, described Mr Fozard’s pie as “delicious”.